The delegation of Surakarta urban village chiefs led by Vice Mayor, Achmad Purnomo, held a working visit to West Jakarta Administration. They were directly welcomed by West Jakarta Acting Mayor, M Zein in the Wijayakusuma Room.
" We want to learn how the river management in West Jakarta that is planned to be applied in Surakarta"
Surakarta Vice Mayor, Achmad Purnomo stated that his party wanted to learn about management of drainages and rivers in West Jakarta. It was very important, as Surakarta region is crossed by five major rivers. "We want to learn how the river management in West Jakarta that is planned to be applied in Surakarta," he expressed, Tuesday (8/28). They also wanted to know policies taken by West Jakarta to change the awareness of residents living on the riverbanks. 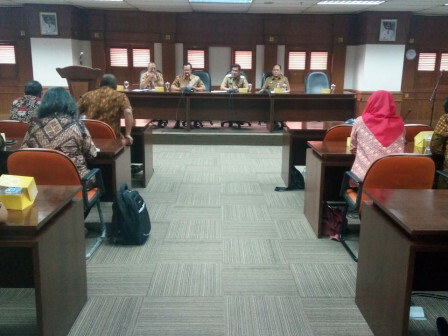 Responding on this matter, West Jakarta Actinv Mayor, M Zen explained that residents on the riverbanks affected by normalization were relocated to flats in Jakarta. He also briefly explained the Besar River arrangement program in the Kota Tua area involving CSR companies. "As a results, the river can be used as one of tourist sites in the Kota tua area," he uttered.